2018 has come and gone in the blink of an eye. This year has held some of my happiest moments and my most terrifying moments. At the close of each year, I like to take time to reflect on the year's events and on my goals. My word of the year for 2018 was "adapt". It was a great word for a year that held many changes. I feel like I did my best to roll with the changes. I knew this year was going to bring challenges and learning curves and I felt confident in learning how to deal with it. My resolutions went fairly well. The only resolution that I didn't complete was catching up on photo books. I usually make headway with my resolutions but I really dropped the ball on that one. I sent more happy mail, I spent time reorganizing the blog and Hubby and I built our savings. I am happy with the results of my other goals. 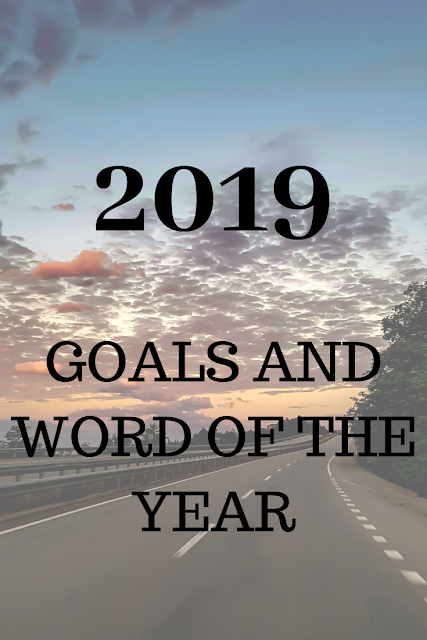 I have come up with my goals for 2019 and I am excited to share them with you. 1.) Establish a Morning Routine. In 2019 I am looking forward to implementing more routine in my day. Our youngest daughter has become much more predictable with her sleep schedule. I feel like it is possible to add better structure to our mornings now that we are getting some sleep! I plan to start waking earlier than my kids (something that fell by the wayside in the last year). I want to complete morning pages, pray, do my physio routine and get ready for the day before my kids get up. I used to do this before I was pregnant and it really helped start my day on the right foot. I require my quiet time before the demands of the day begin. 2.) Treat the Earth better. The planet needs some help. We are supposed to be "stewards" of the Earth and, as a society, we haven't been doing a great job of it. I love to bath daily but it is a huge waste of water. I plan to limit baths to twice a month and take short daily showers instead. I want to walk and ride my bike more instead of always hopping in the car. I plan to work on reducing my food waste and try my best to mindful of what we purchase. I am hoping that these small changes will somehow help. 3.) Save. Hubby and I are working toward a few major purchases that we need to save for. We want to continue to increase our savings. 4.) Walk five or more times a week. My poor patient puppy has been a bit ignored this past year. With all of the changes, my dog didn't get walked nearly enough. I want to rectify that this year. I want to walk her at least five times a week, hopefully daily. My word of the year for 2019 is embrace. I want to embrace my own boundaries (something that I still struggle with), embrace the needs of my family and embrace those around me for who they are. I want to be positive in the coming year and really work to find the good in everyone and everything around me. How did your 2018 goals go? What do you have planned for 2019? I would love to hear all about it! I will be taking the rest of the week off to enjoy some family time and my youngest daughter's first birthday! I will return next week with my "New Year Purge and Clean" series. Happy New Year! Holiday Season- Capsule Wardrobe Reveal. I am seeking a peaceful, simple life in the Great White North with my Hubby and two daughters.